On June 06th of 2010 I was searching for fungi on the trails of Hot Springs National Park and I took a photo that I labeled “Fungi Flowers”. The past four years I have searched the Upper Dogwood trail for another sighting of the unusual flowers. On June 17th of 2014 I was bless with a eureka moment and found a cluster of the same plant at a later growth stage. After further investigation I discovered they are Pinesap (Monotropa hypopitys) a Parasitic Wildflower. The USDA cutbacks mean they no longer have anyone accepting images and data regarding rare and endangered plants. According to the data on their site Pinesap (Monotropa hypopitys) has not been verified as sighted in Garland County Arkansas. http://plants.usda.gov/java/county?state_name=Arkansas&statefips=05&symbol=MOHY3 I am creating this posting as a record for later use to update their information. 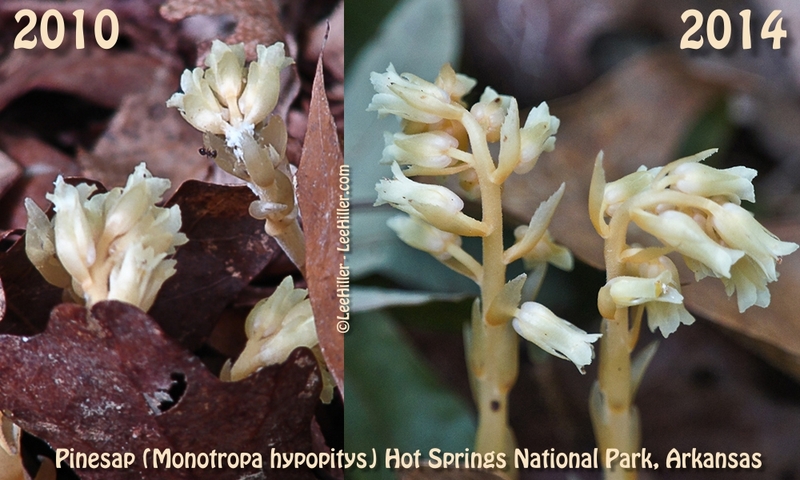 I have sighted and photographed Pinesap (Monotropa hypopitys) twice on the same trail in separate years but only have GPS data for 2014. Pinesap is an herbaceous perennial wildflower with a wide geographic distribution throughout the United States and Canada. However, Pinesap is a rarely encountered wildflower. My husband and I realized we had not been out to Cedar Glades Park in Garland County Arkansas since the government shut down in 2013 that locked us out of Hot Springs National Park. If you like tall Trees, Fungi, Wildflowers and Insects you will enjoy the various park trails. I love the Fungi but have no clue the names for the majority of them. The variety of shapes and colors are wonderful. It is like an Easter egg hunt in the Forest trying to spot all the unique shape and color combinations. The numerous rainy days and higher temperature have created a bountiful crop throughout our area in Arkansas. I Love the strength and beauty of Fungi. Even the tiniest Fungus pushes through Leaves, Rocks and Pine Needles to reach for the light. The lovely Indigo Buntings have been teasing me since late April. Only allowing tantalizing glimpses of their beautiful blue feathers as the lush foliage emerged. I took a few photos many weeks ago, but shooting into the sun meant I had to over lighten the image to see his colors. This time two let me see them out in the open. A larger male stalked through the grass looking for breakfast as a younger male perched in a dead tree say a lovely mating song. I need to apologize to my beloved husband for bumping him out of my way as I raced up and down the trail tracking these lovely birds. When I am in my photography zone nothing but the subject has my attention.